If you are an avid blog visitor or if you go to websites such as BBC, or any other website where you happen to read something – check out the following four Google Chrome extensions that will make your reading experience even better. These extensions allow users to remove the junk (e.g ads, links etc.) around the reading material allowing them to focus more on the material rather than on the distracting ads, links, etc. Readability is a great app for people who intend to remove the clutter from a website and just read the information provided on the web page now or later. The app “zaps” the clutter and saves the web articles in a comfortable reading view which ensures maximum focus on the content and not on ads. To get started, you must create an account on Readability. Just click on the “Read Now” button to disable surrounding webpage clutter and noise and take the reading material into a very clean area. If you don’t have time, you can save the article to your Readability account and read it later. 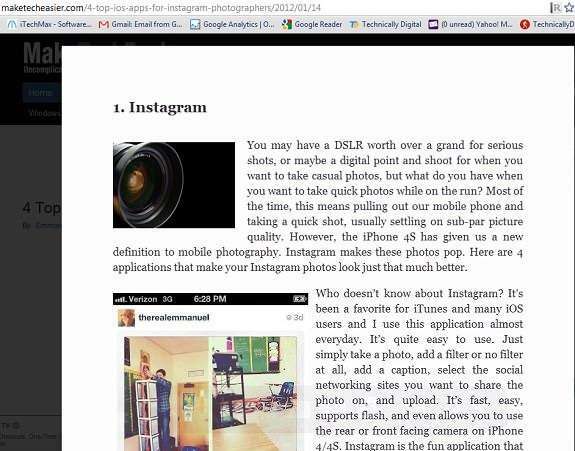 You may also share the articles with your friends via e-mail or Facebook or any other social networking website. You can easily send material directly to your Amazon Kindle if you have one (with subscription). iReader allows the user to take the reading content available on a web-page to a simple one-panel scrollable window, thus avoiding the clutter and junk displayed on the website and keeping your focus on the news you came for. Using the app is simple. Once you arrive on a web page where reading material is available (the iReader icon will appear), just click the iReader icon to open the iReader window with the material displayed in a simple one-panel display. You can also print the article quickly, or share it with your friends over Facebook or send the article via E-mail to anyone you wish quickly. 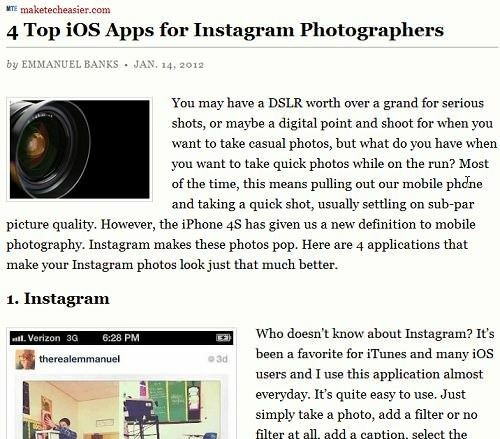 Clearly is a great and innovative app for people who often visit blogs and news websites. 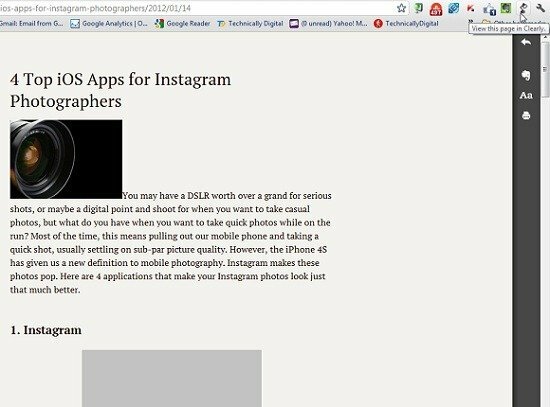 The app allows such users to bring down the blog posts, articles and webpages into a clean and easy to read format. The best thing about the service is that the user can save the article to their Evernote account allowing them to read it from anywhere they wish. If there are multi-pages on the news site, Clearly will bring them down to one seamless window. 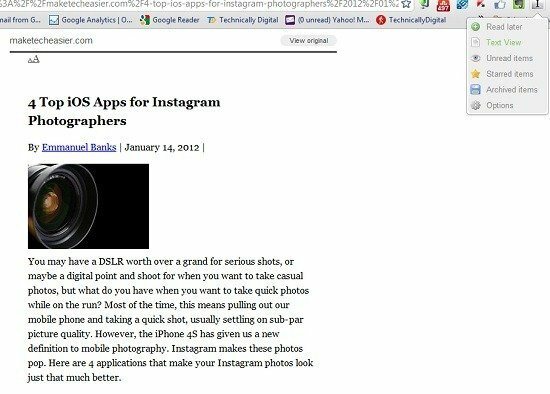 If you have an instapaper account, you should definitely check out Instachrome, which allows users to save URLS and collect articles on the web to read later on through their instapaper account. The whole process is a matter of one-click by which you can save the article for later viewing or even view at that very same time if you have the time to do so. If you like the article so much, or if you feel the article might come handy later on, you can archive it for later viewing purposes. There you have it folks – some four really helpful apps available for Google Chrome that allow users to cut down web-pages into simple one panel view box ensuring that the user pays maximum focus on the article itself and not on distractions at the side of the web-page. is there any Reader in Safari alike?